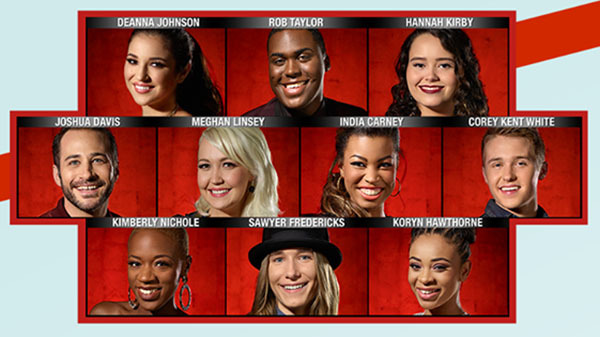 Who’s eliminated on The Voice Season 8 tonight? The results are in and the eliminated singers from the Top 10 will be revealed tonight, April 21, 2015. Check out the Top 10 Performance Recap and Videos here! The Top 10 — Rob Taylor, Sawyer Fredericks, Corey Kent White, Meghan Linsey, Hannah Kirby, Kimberly Nichole, India Carney, Mia Z, Koryn Hawthorne, Joshua Davis, Deanna Johnson and Brian Johnson — have performed last night. It’s time to find out who made it to the Top 8 of The Voice Season 8! Also tonight, American country music singer and songwriter Reba McEntire will perform “Going Out Like That” on the show. Who do you think will move on and who will go home? Write your prediction below! Keep locked on this page, results will be posted below once announced! Team Pharrell Williams open the show, they sing “I Don’t Wanna Be” by Gavin DeGraw. America saved Corey Kent White! Joshua Davis, Deanna Johnson and Rob Taylor are in the Bottom Three! Joshua Davis wins the Instant Save! What can you say abut the results tonight? Write your thoughts on the comment section below!